In April of last year, a box of stem cuttings arrived in my mailbox. They were sent to me by a friend in Colorado called Sandra (you may know her from one of her many ventures: Greenwoman Magazine, Greenwoman Publishing, Flora’s Forum, etc.). Sandra’s carrion flower had bloomed that spring, a stinky but delightful occasion. 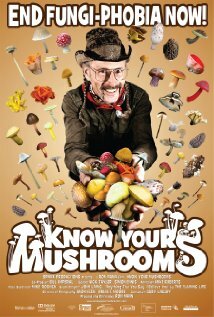 In her excitement, she asked if I would be interested in growing some carrion flowers of my own. Not one to turn down the chance to try my hand at cultivating something unusual, I gladly accepted her offer of a few cuttings sent via Priority Mail. Six cuttings arrived shortly thereafter, and upon reading through some instructions on the internet, I nestled them into their new home and hoped they would put down roots and stay a while. There are several species of plants that are referred to commonly as carrion flower. 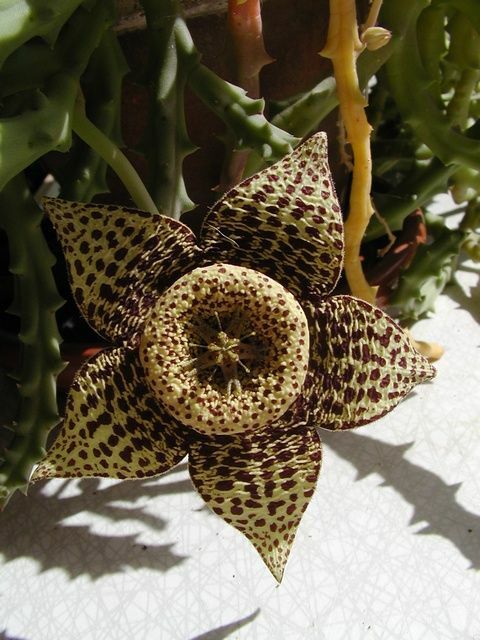 The plant parts I received from Sandra are in the genus Stapelia (family: Apocynaceae or dogbane family), also known commonly as African starfish flower. There are around 100 species in the genus Stapelia, and they all originate from tropical and southern Africa, mostly in arid regions. 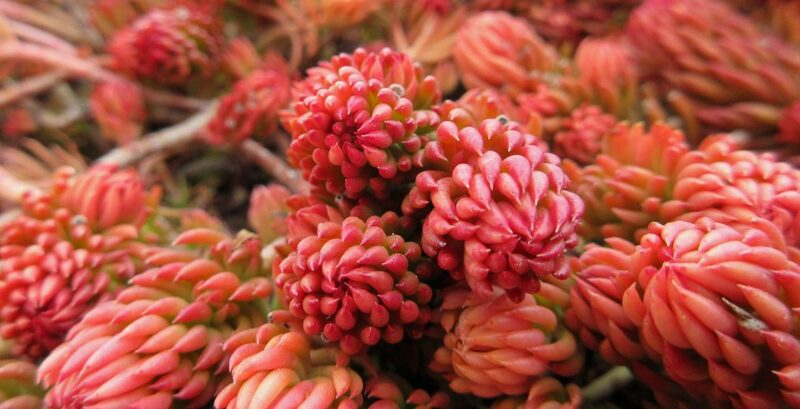 Stapelias are short-lived, low-growing, perennial succulents. Their stems typically stand erect and are produced along stolons (above ground runners), creating a tight clump of stems that appear cactus-like. 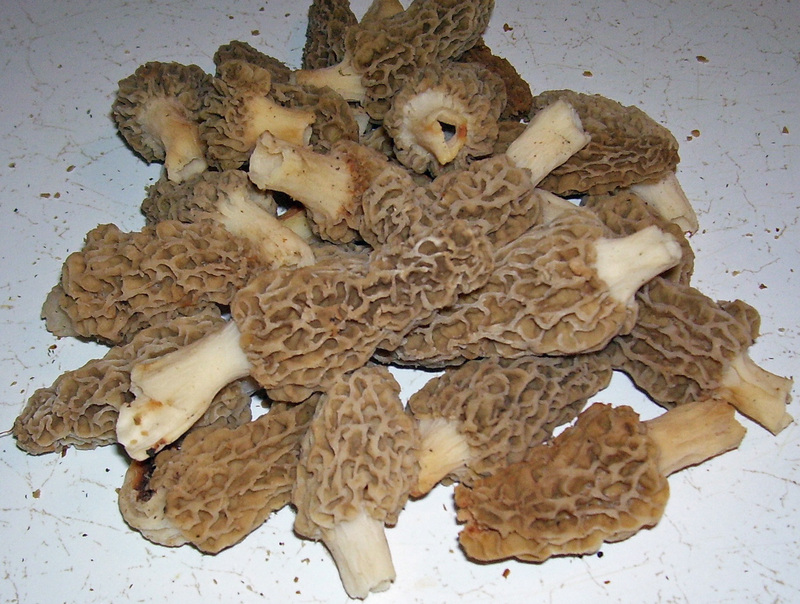 Each stem has 4-6 flattened vertical flanks, giving it a cross or star shape when looking down from the top. On the outside edges of the flanks are a series of rudimentary leaves protruding from tubercles (wart-like growths), giving the stems a spiny appearance. The stems are usually green but can also be red or mottled with red or purple. 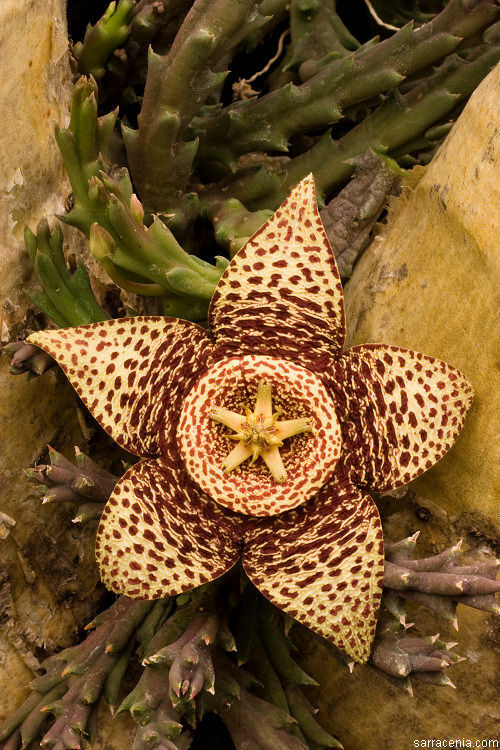 The flowers of Stapelia are the real show. They are produced at or near the base of the stem and have a star-shaped corolla with five fused petals that come to sharp points. The corolla has a wrinkly look and is often hairy, especially along the margins. Flowers can be variations of red, brown, yellow, and purple. In some species they can reach up to 18 inches wide. It is a unique looking flower, but even more unique is its scent. Because Stapelia flowers are pollinated by flies, they emit the scent of rotting animal flesh, an odor that flies can truly appreciate. In fact, flies can be so deceived by the appearance and scent of the flowers that they occasionally lay their eggs on or near them, expecting them to be a food source for their emerging larva. 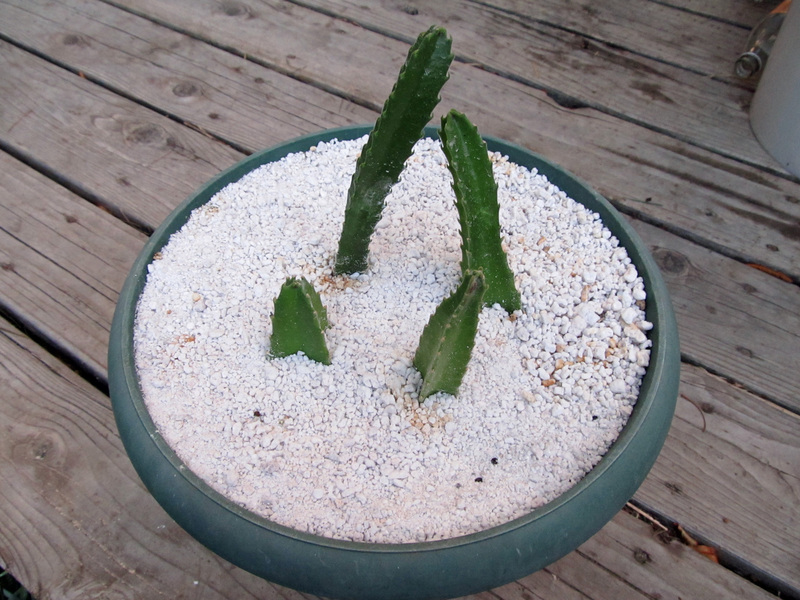 Stapelia is easily propagated, especially by stem cuttings. 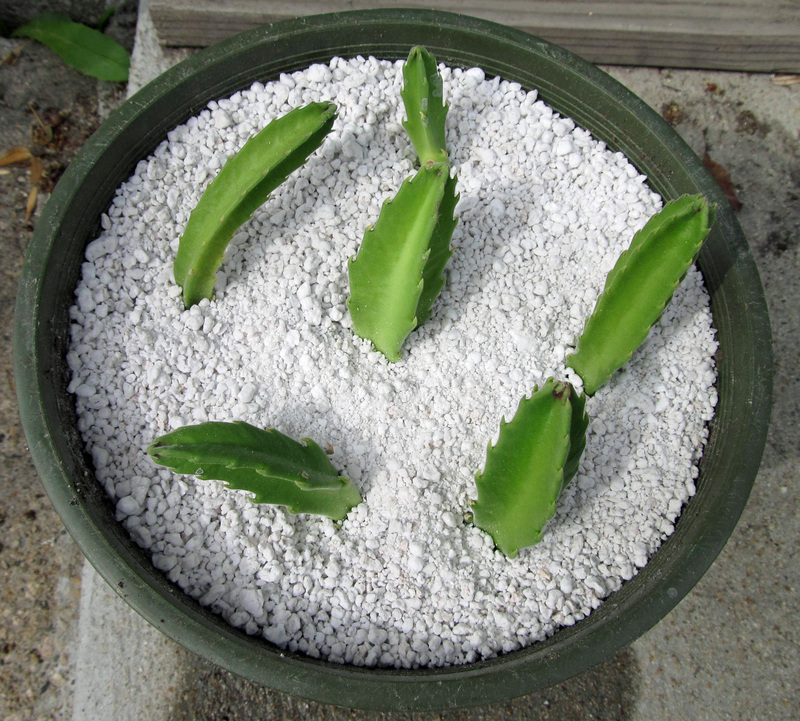 Allow cuttings to dry in a cool, shady location for 48 hours and then stick them in a well-drained potting soil mix. Water moderately (preferably from below by placing the container in a tray and then filling the tray with water). Cuttings should root easily. All six of mine did. Keep Stapelia in a sunny or mostly sunny location. If you live in USDA hardiness zone 9 or above, you can grow Stapelia outdoors. Otherwise, keep it indoors near a window that gets lots of sun. The main thing you will have to worry about is stem rot due to over watering. Grow Stapelia in a well-drained soil mix, water from below, and allow soil to dry out between waterings in order to avoid this. As for me and my carrion flowers, like I said earlier, all six cuttings rooted. I transplanted one of them. Of the five left in the original pot, one rotted a couple weeks ago and another rotted during the writing of this post. The remaining ones still look healthy, but none of them have grown much since they rooted. The main problem I am having is that my house does not let in much sunlight. What appears relatively bright to me is probably cave-like to my carrion flowers. Until I remedy that situation, they may not grow much, they could continue to rot, and they probably won’t flower any time soon. However, if anything changes and I do get a flower out of them, I will make it a point to let you know. And Sandra will be proud. Trees help reduce air pollution. They do this primarily by pulling gases (like ozone, sulfur dioxide, and nitrogen dioxide) into their leaves and then diffusing them and/or chemically altering them so that they are no longer a direct threat to humans. They also intercept particulate matter, trapping it on the surfaces of their leaves until the wind comes along and blows it away or the rain comes around and washes it into the soil. Trees are filters in this sense, reducing the health threats of our polluted air. But didn’t I just report on the contribution of urban trees to air pollution via their production of volatile organic compounds? Yes I did. And that remains a possibility; however, according to a study recently published in the journal, Environmental Pollution, the presence of trees is a great benefit to human health despite potential risks. More research is necessary of course, but the consensus so far is that having trees around is a net positive. There have been many studies on the relationship between trees and air quality, but little is known about the extent to which human health impacts are avoided and the related money that is saved as a result of air pollution mitigation by trees and forests. With the aid of computer simulations, researchers at US Forest Service and The Davey Institute used 2010 Census data, tree cover maps from the 2001 National Land Cover Database, US EPA’s BenMAP program, and other data to seek answers to these questions. Their analyses – focused at the county level – involved the 48 contiguous United States. According to their study, trees and forests removed around 17.4 million tons of air pollution in 2010, which resulted in a health care savings of $6.8 billion. 850 human deaths were avoided, and incidences of acute respiratory symptoms were reduced by 670,000. Ozone and nitrogen dioxide experienced the greatest decrease, while the removal of ozone and particulate matter resulted in the greatest health value. Air pollution removal was greater in rural areas compared to urban areas simply because there is more rural area in the US than urban area; however, the removal of air pollution was found to be more valuable in urban areas due to differences in population density. Resulting health benefits and savings are quite dramatic considering that air pollution removal by trees was only found to improve air quality by about 1%. There were many things left out in this study though, and the researchers acknowledge this. 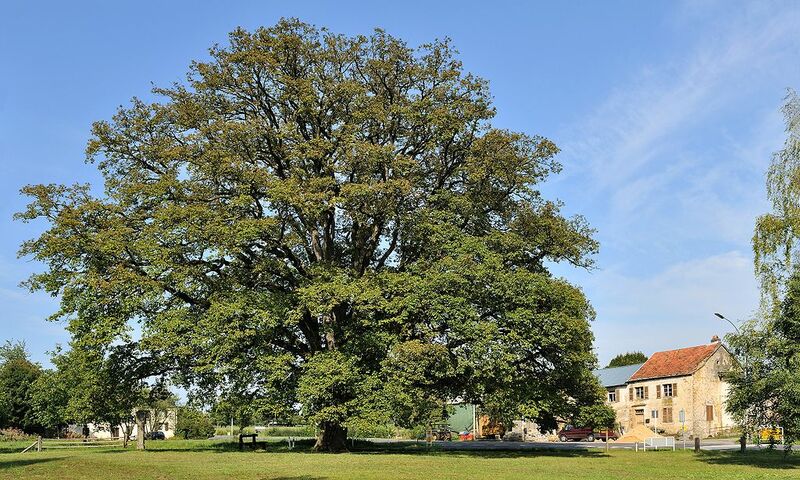 First of all – as stated earlier – trees have the potential to contribute to air pollution. They emit volatile organic compounds which can result in ozone formation, they can reduce wind speeds which concentrates pollutants, and they produce pollen which is a direct contribution to air quality and a major health issue for those with serious allergies. But trees reduce air pollution in indirect ways as well. For example, by shading buildings, trees can reduce energy demands which results in decreased power plant emissions and a reduction in air pollution. Trees can also be negatively affected by air pollution. When particulate matter collects on leaf surfaces, photosynthesis is compromised, limiting a tree’s ability to take gaseous air pollution into its leaves. Urban trees are stressed in additional ways. 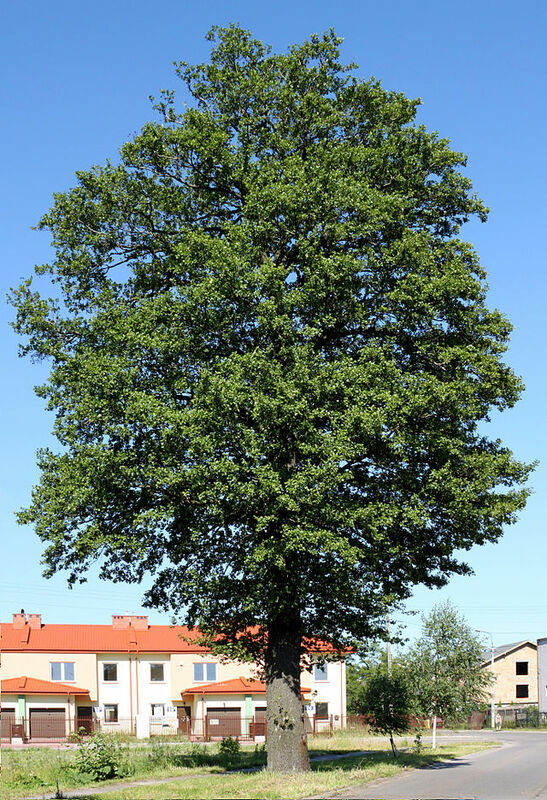 For example, trees growing near sidewalks, driveways, and roadways deal with serious soil compaction and are often not receiving optimal amounts of water, which can limit their ability to mitigate air pollution. 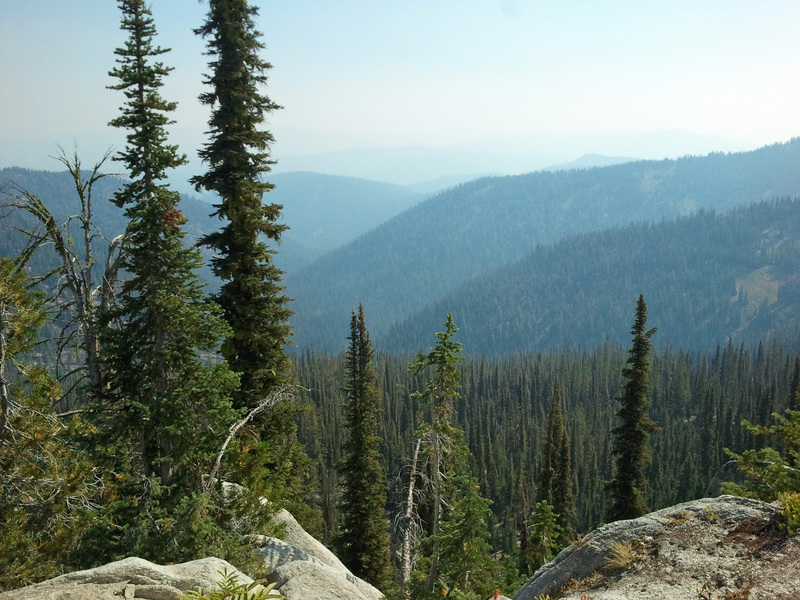 Thus, environmental factors should be considered when determining the relationship between trees and air quality. This study was conducted at the county level. The researchers acknowledge that more precise predictions could be obtained if analyses were conducted at a finer scale. “Local-scale design of trees and forests can affect local-scale pollutant concentrations.” So, the number of trees, their concentration and configuration, the length of the growing season, the percentage of evergreen trees vs. deciduous trees, etc. all play a role in the extent of air pollution reduction. While limitations to the study abound, the researchers assert that this initial analysis gives “a first-order approximation of the magnitude of pollution removal by trees and their effect on human health.” Future studies will provide more accurate approximations, but for now I think it is safe to say that trees are good for our health and worthwhile things to have around. This study focused mainly on health issues of the respiratory variety. The positive psychological benefits of plants have been observed in separate studies, and our also worthy of our consideration when determining the health benefits of trees and forests. 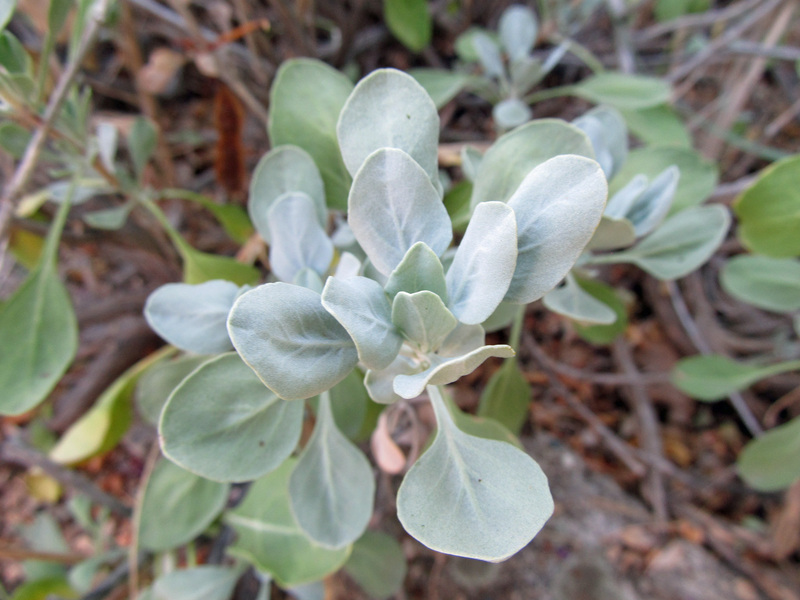 If you are considering installing a drought tolerant garden on your property or including more drought tolerant plants in your landscape, one plant that should come standard is blue sage. Its silvery-green foliage, large, abundant, purple-blue flower stalks, and attractive mounded shape, make it an excellent feature in any water-efficient garden bed. Salvia pachyphylla is in the mint family (Lamiaceae). 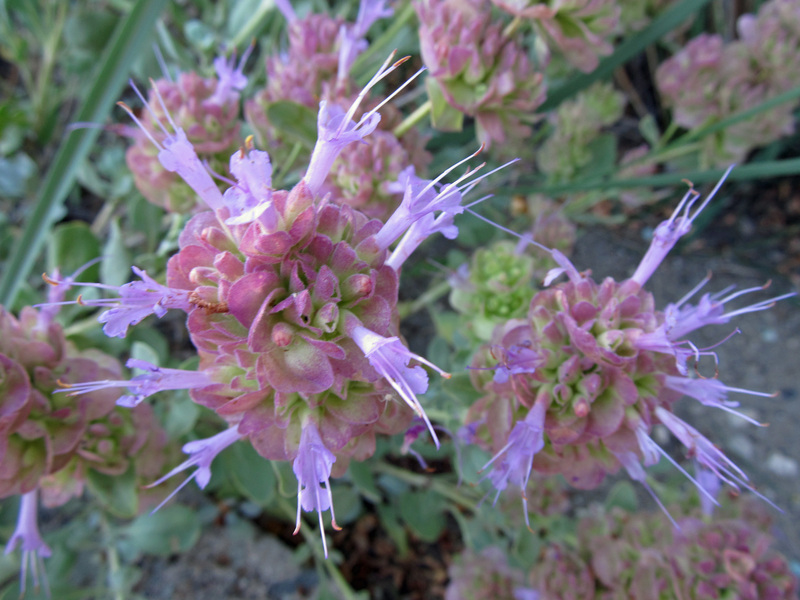 It has several common names which it shares with several other plants: blue sage, Mojave sage, rose sage, mountain desert sage, giant-flower sage. For this post we will refer to it as blue sage; however, if you’re looking to purchase it, make sure to verify the botanical name. Blue sage is a subshrub that can grow up to 3 feet tall and 3 feet wide. It tends to remain smaller – around 1-2 feet tall – in its native habitat. It is found in the southwestern states of the United Sates on dry, rocky slopes and flats at elevations between 5,000 – 10,000 feet. The leaves are oppositely arranged and covered with fine hairs that lay tightly against the leaf surface giving the foliage its silvery appearance. Like all other sages, the leaves of blue sage are highly aromatic. The flowers appear in compact clusters on spikes that extend upward from the branches. The inflorescences can be several inches long. They have numerous large, purple bracts that appear in a whorled pattern along the spike. The violet-blue flowers are small but prolific and appear between the bracts surrounding the stalk. Flowering occurs throughout the summer (July-September in its native range). The flowers attract droves of pollinators including bees, butterflies, and hummingbirds. 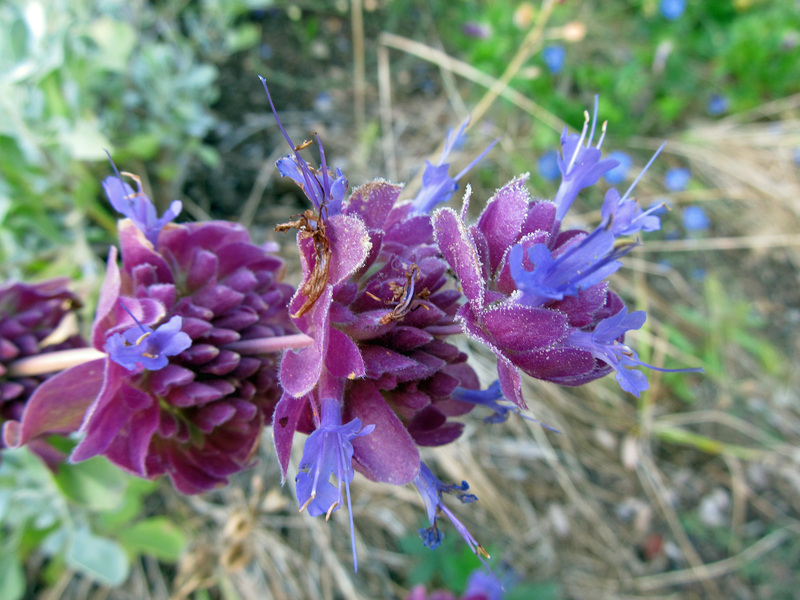 Blue sage is especially beneficial to native pollinators. In fact, while taking photos for this post, I noted that the flowers were being visited by several bumblebees. Its benefit to pollinators is another great reason to include this plant in your landscape. Blue sage is a very drought tolerant plant. Once it is established it requires only occasional watering throughout the summer in order to keep it looking good. It performs well in a variety of soil types, but like most drought tolerant plants it is best placed in well drained soil. Heavy soils can be amended by mixing in things like sand, lava rock fines, and compost at planting time. It prefers full sun and is winter hardy to USDA hardiness zone 5, especially if planted in an area where the soil is relatively dry throughout the winter. Blue sage is a long lived plant and can be kept in shape by cutting back the spent flowers in the fall. The folks at Plant Select recommend planting blue sage with, among other things, penstemon, coreopsis, and creeping veronica. Photos were taken at Idaho Botanical Garden in Boise, Idaho.